Composting in urban areas and small spaces can seem particularly difficult, if you’re not quite sure where to start to begin with. Add in zoning issues (many suburban subdivision have by-laws about composting), fussy landlords, if you are renting, or the fact that you live on a twentieth floor apartment, can make it an insurmountable issue to get started. But cheer up, there are viable options to make you happy and help you stay out of trouble with the powers that be! Bear with me here, as I’m going to do a brief tutorial on composting, for those who really aren’t sure where or what it is. Compost is broken down organic material that comes from household and garden waste, and is then added back into your soil. It used to be, in the days before garburators, weekly garbage collection, and recycling, that everyone had to care for their own garbage. Every household had a kitchen waste pile out behind the house on which food scraps, weeds, and such got tossed. Over a period of a few months, the pile would slowly decompose back to good soil, which would be put back into the garden. The richness of the compost pile made for great vegetables and fruits. One did NOT add meat scraps and fat or bones, or dairy to the pile. Instead of decomposing slowly, they rotted quickly, and attracted things you don’t want to have to deal with in your garden, like maggots, wasps and hornets, bears, and whatever else. One also did not add dog or cat feces or human waste, as it was discovered that after a while, people got sick when this was added to the garden. It made beautiful compost, but was not such a good idea for vegetables. One could, on the other hand, add chicken, horse, cow, and pig manure, composted, with fantastic results. Remember that green thumbs have been refining this process for thousands of years, starting, I’m sure, with Abel after the Garden of Eden. This composting process combined two well-defined universal facts. 1. ‘Waste not, want not’, the old-fashioned adage that one didn’t waste anything, and everything had a use. 2. ‘For every action there is an equal and opposite reaction’ (Newtons Laws of motion), which applies to physics, karma, and just about every other aspect of life, and particularly gardening. And in gardening, no matter what you hear, the first and most basic gardening fact is that growing food takes matter out of the soil. If you wish to keep healthy soil and have healthy, happy vegetables and fruits, you have to put organic matter back in, to keep it thick and rich, to hold moisture, and support life. If you don’t believe this, try a three- or five-year model on your garden, where you don’t add organic matter in, try and solve the problem with chemical fertilizers, and let me know what your soil and production is like in five years. Time and again, I have seen people do this to their gardens, and after the first three or four years, they can’t figure out why their soil looks terrible, sandy, the plants aren’t growing right, often turning yellow or getting diseases and dying. In the end, they throw up their hands, say, ‘We used to have such nice soil, I guess we will have to replace it’, and then have to go to all the trouble of hauling away the ‘bad dirt’, and hauling, or paying someone to haul in some nice, black top soil, and start over. And most have no idea why this is happening. Take care of your soil. 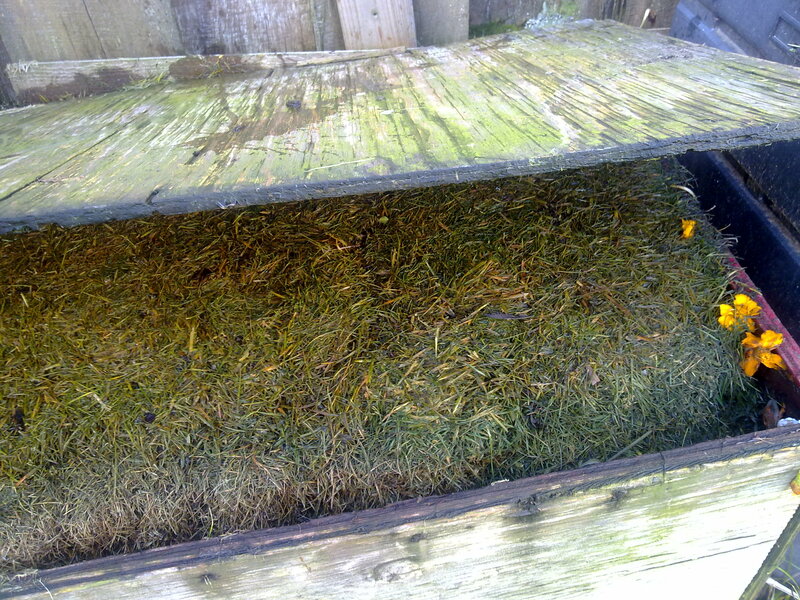 You can do this with composting, and there are two main parts to this. Add matter back into it in the form of garden compost, which you can easily do with a composter. You can also combine this with another method, earthworm composting, which I cover in another blog post here. Your garden will love you, I’m sure, and will reward you with many years of production and happy plants! We live in an urban neighbour hood in a small town, an old town, so we don’t have the by-laws that many newer subdivisions in big cities have (which is something you should add to your check list if you are buying a house, by the way. Find out if you are allowed composting and small farm animals. Many new places you are not allowed to have a chicken or two in your back yard. And ignorance does not excuse you of the consequences). We have a couple old bins, one grandpa built, obviously, one he got at some place like Canadian Tire years ago. It has a little trap door down at the bottom on the front, that you can reach in and scoop out compost as its ready to put in your garden. Or you can invest in a bigger type, with a revolving barrel. While generally more expensive, these have the advantage of making compost quickly, and you don’t have to turn the compost pile yourself! However, you can make your own compost bin, very easily, and here is how. 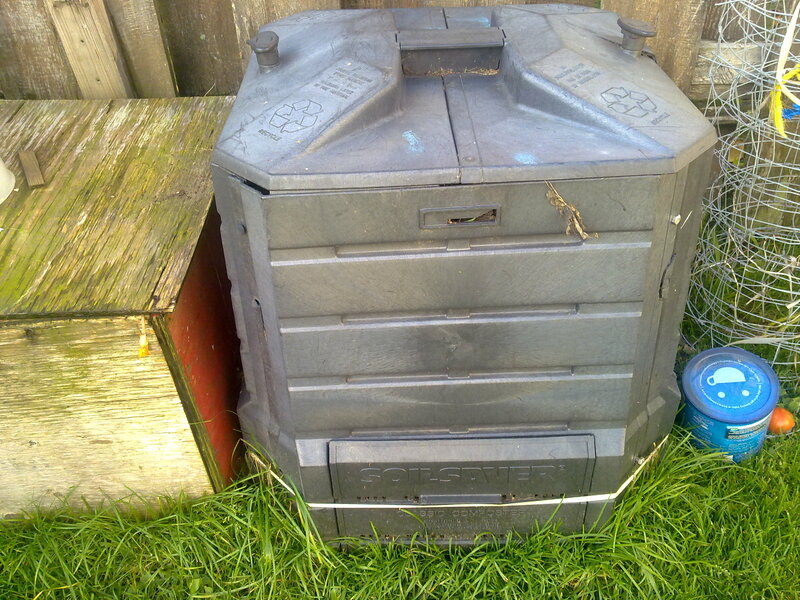 The simplest compost barrel to use is a garbage can. Yup, that’s right, and if you can swing it, get an upright one with the two wheels that makes it easier to drag to the curb. Only your going to drag it to the garden full of nice compost! You should be able to pick one up at Canadian Tire or Walmart for $20-$30. Get a sturdy plastic one with a lid, of course. Drill some holes around the bottom for drainage. Six to eight holes should be good. Drill some around the top, just under where the edge of the lid sits for ventilation. Add in some food scraps, and grass clippings, and a couple shovels full of garden dirt, to get some extra micro-organism action happening. If you can, add a half dozen earthworms in to aid the process. Every few days, use those wheels to tip the garbage can on its’ side, roll it back and forth a few times to shake everything up a little, and stand it back in its’ corner. The contents should be moist, although not soaking wet. On warm or hot days, check to make sure that it has some moisture in there, give it a quick spray with the garden hose if necessary. This should give you some great dirt in a few weeks, with minimal expenditure, and effort. Do you have a composter? What has worked best for you? Write below and share your ideas. And if you know someone this blog post might help, please share it with them too! This entry was posted in Recycling in the Garden and tagged compost bins, composting, garden compost, make your own compost bin, urban composting, use garbage cans for compost bins. Bookmark the permalink.